Skype for Business is an instant messaging client (IM) used with Skype for Business Server or with Skype for Business Online (available with Microsoft Office 365). Skype for Business is enterprise software. On 11 November 2014, Microsoft announced that Skype for Business would replace Lync in 2015. The latest version of the communication software combines features of Lync and of the consumer software Skype. There are two user interfaces – organizations can switch their users from the default Skype for Business interface to the Skype for Business (Lync) interface. In September 2017, Microsoft announced that Microsoft Teams would replace Skype for Business eventually. On May 20, 2018, Microsoft retired Skype for Business for Windows Phone. Microsoft released Office Communicator 2007 to production on 28 July 2007 and launched it on 27 October 2007. It was followed by Office Communicator 2007 R2, released on 19 March 2009. Microsoft released the successor to Office Communicator, Lync 2010, on 25 January 2011. The full-featured desktop version of the client requires Windows 7, Windows Vista or Windows XP with Service Pack 2 or newer. Lync 2010 was released for the Windows Phone, Android, and iOS platforms in December 2011. Lync 2010 was succeeded by Lync and Lync Server 2013, which were released in 2012. On 11 November 2014, Microsoft announced that Lync would be replaced by Skype for Business in 2015, which would combine features of Lync and the consumer Skype software. In April 2015, Microsoft officially launched Skype for Business. 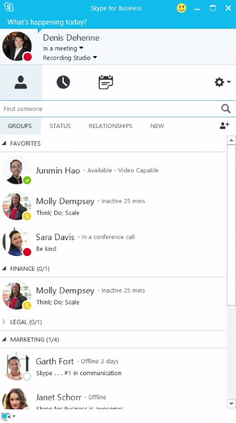 On 22 September 2015, Skype for Business 2016 was released alongside Office 2016. On 27 October 2016, the Skype for Business for Mac client was released. On 7 September 2017, users began noticing a message that stated "Skype for Business is now Microsoft Teams". This was confirmed on 25 September 2017, at Microsoft's annual Ignite conference. All communication between the clients takes place through a Skype for Business Server. This makes communications more secure, as messages do not need to leave the corporate intranet, unlike with the Internet-based Windows Live Messenger. The server can be set to relay messages to other instant messaging networks, avoiding installation of extra software at the client side. A number of client types are available for Microsoft Lync, including mobile clients. Collaboration through Whiteboard documents, where the participants have freedom to share text, drawing and graphical annotations. Collaboration through PowerPoint documents, where the participants can control and see presentations, as well as allow everybody to add text, drawing and graphical annotations. Windows applications sharing, by allowing participants to see and collaborate on a specific application. All collaboration sessions get automatically defined as conferences, where clients can invite more contacts. Conference initiators (usually called "organizers") can either promote participants to act as presenters or demote them to act as attendees. They can also define some basic policies about what presenters and attendees can see and do. Deeper details of policy permissions are defined at server level. Following Microsoft's acquisition of Skype in May 2011, the Lync and Skype platforms could be connected, but sometimes only after lengthy provisioning time. Lync uses a number of extensions to the SIP/SIMPLE instant-messaging protocol for some features. As with most instant-messaging platforms, non-Microsoft instant-messaging clients that have not implemented these publicly available extensions may not work correctly or have complete functionality. Lync supports federated presence and IM to other popular instant message services such as AOL, Yahoo, MSN, and any service using the XMPP protocol. Text instant-messaging in a web browser is available via Lync integration within Exchange Outlook Web App. Although other IM protocols such as AIM and Yahoo! do have wider support by third-party clients, these protocols have been largely reverse-engineered by outside developers. Microsoft does offer details of its extensions on MSDN and provides an API kit to help developers build platforms that can interoperate with Lync Server and clients. Windows Phone and Windows 10 Mobile apps were retired by Microsoft in May 2018. ^ "Skype for Business Online". Microsoft. Retrieved 2 November 2016. ^ a b Pall, Gurdeep (11 November 2014). "Introducing Skype for Business". Office Blogs. Microsoft. Retrieved 11 November 2014. ^ "Switching between the Skype for Business and the Lync client user interfaces". Microsoft. Retrieved 3 September 2015. ^ a b "Microsoft Teams is replacing Skype for Business to put more pressure on Slack". The Verge. Retrieved 26 September 2017. ^ "Microsoft Office Communicator 2007 Releases to Manufacturing". Lync Team Blog. Microsoft Corporation. 28 July 2007. ^ "Microsoft Communicator 2007 Life-cycle Info". Retrieved 25 October 2011. ^ "Microsoft Lync 2010 Life-cycle Information". Retrieved 25 October 2011. ^ "Download details: Microsoft Office Communicator 2007 R2 Trial Download". Microsoft Download Center. Microsoft Corporation. Retrieved 9 December 2010. ^ "Microsoft Lync 2010 released for iOS platform". Youmobile.org. 20 December 2011. ^ Hernandez, Pedro (14 April 2015). "Microsoft Launches Skype for Business". eWeek. ^ Skype for Business Team (27 October 2016). "Skype for Business announces new Mac client and new mobile sharing experiences". ^ Foley, Mary Jo. "Microsoft may be repositioning some (or all) of Skype for Business as Teams | ZDNet". ZDNet. Retrieved 26 September 2017. ^ "Microsoft Office Communicator 2007 product overview". Microsoft Office. Microsoft. Archived from the original on 19 October 2007. Retrieved 10 October 2007. ^ a b "Microsoft Office Communicator 2007 Protocol Documents". MSDN. Microsoft. Retrieved 15 August 2008. ^ "Pidgin project trouble ticket describing problems with Microsoft's SIP/Simple Implementation". Pidgin. Retrieved 15 May 2008. ^ "Lync 2010 API Concepts". ^ "Install Skype for Business". Office support. Microsoft. Retrieved 2 November 2016. ^ "Lync for Linux". TEL.RED. Retrieved 1 January 2017. ^ "Skype for Business (formerly Lync 2013)". iTunes Store. Apple Inc. Retrieved 22 November 2015. ^ "Sky - for Lync and Skype for Business". iTunes Store. Apple Inc. Retrieved 17 April 2016. ^ "Skype for Business for Android". Google Play. Google. Retrieved 31 December 2015. ^ "Sky: Lync & Skype for Business". Google Play. Google. Retrieved 17 April 2016. ^ "Install Skype for Business on a mobile device - Windows Phone". Office Support. Microsoft. Effective May 20, 2018, the Windows Phone app for Skype for Business will be retired and will no longer be available for download from the Windows Phone Store. This page was last edited on 7 March 2019, at 01:37 (UTC).